A substantial point in the EAW matter is a more pronounced warming of the Northern Hemisphere and primarily during the winter season. That is exactly what the warming period in the early 20th Century is primarily all about. While the summer temperatures increased only modestly, the winters generated steep warming as observed at Spitsbergen (Figure below, I-3), which is also well reflected in the annual data set latidues north of 70°N (Fig. I-2). The decade from 1921 to 1930 showed remarkable winter warming (Fig. G3-1, p. 173), which lasted until 1940. This fact is a paramount aspect to identify the reason for this significant shift during the winter period. The influence of the sun is remote north of 50°N (i.e. London, Vancouver), but any warming must have been coming from somewhere else. 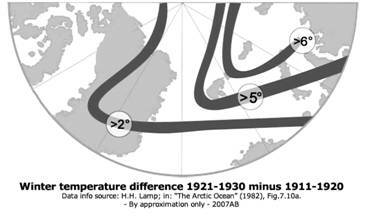 The upper two rows in TM14, (next page) give a clear indication that the previous warming period in the 1920s and 1930s was located primarily in the North Atlantic section of the Arctic Ocean . 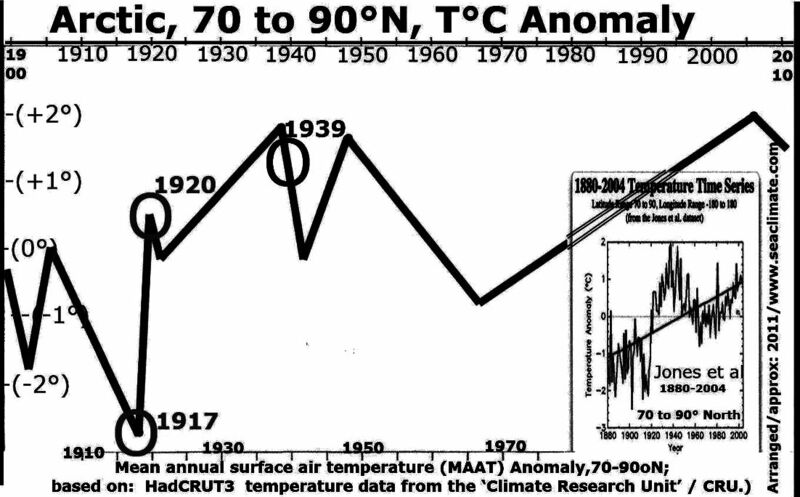 Graphics demonstrate equally that the temperature rise commenced before 1920, probably in 1918. This date (1918) should be regarded as the time when Arctic suddenly moved into a strong warming period. 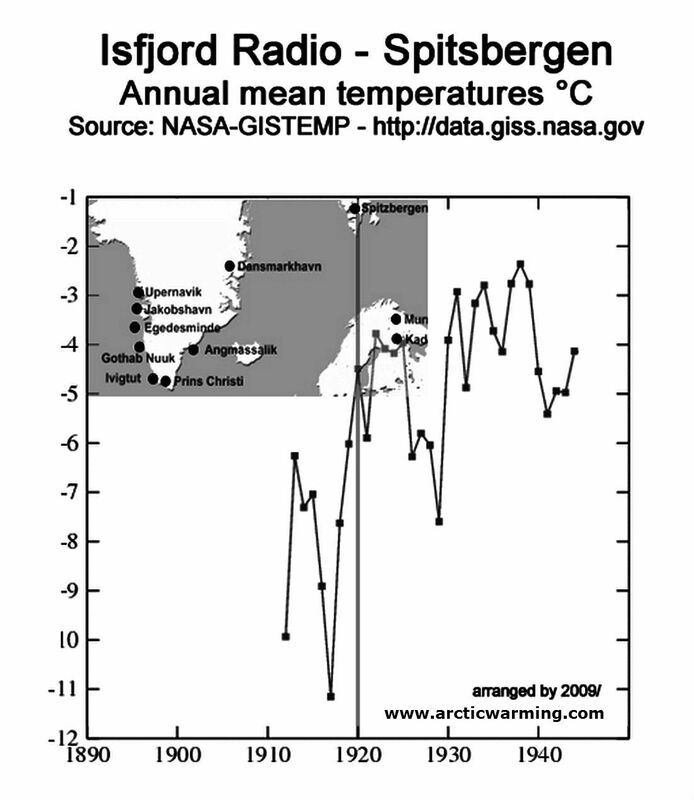 Actually warming started in the Spitsbergen region, and was only subsequently observed beyond this station. 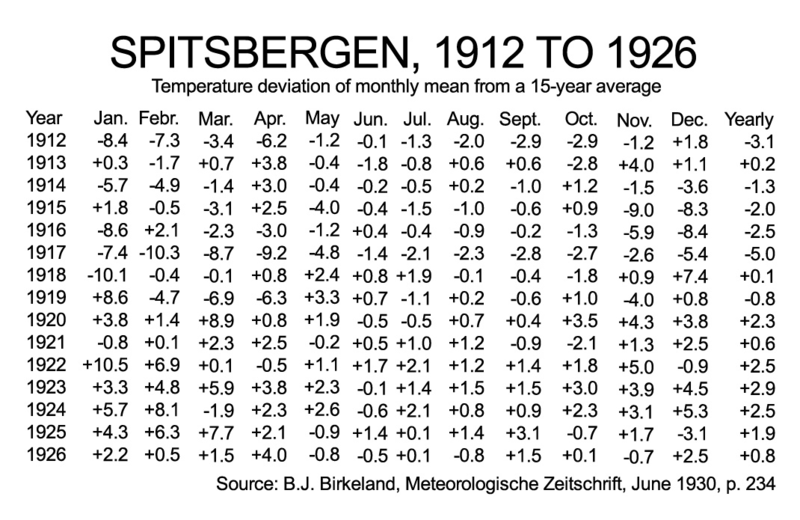 With some generalisation there had been a modest temperature increase before 1910 (Fig. I-2), followed by a significant decrease from 1910 to 1917. 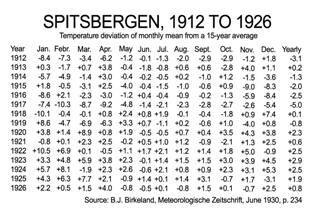 At Spitsbergen the shift between winter 1912 and 1918 and winter 1919/23 is about 8°C, for the whole Arctic region the increase between the decades before and after 1919 is about 2°C. 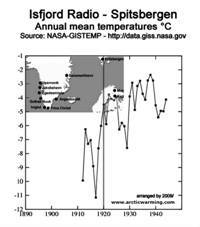 Having established the time and region of the sudden temperature shift close to Spitsbergen and narrowing down to the winter of 1918/19, it is high time to ask, what caused and sustained the warming for two decades. The Arctic Ocean winter weather is dominated by a sunless period for more than 6 months, full sea ice cover, extreme cold, low humidity, low cloudiness, and anticyclones. Neither sun spots, nor carbon dioxide, nor water vapor can be considered as a significant direct contributor to generate such a sudden remarkable shift and keep it sustained for over two decades. 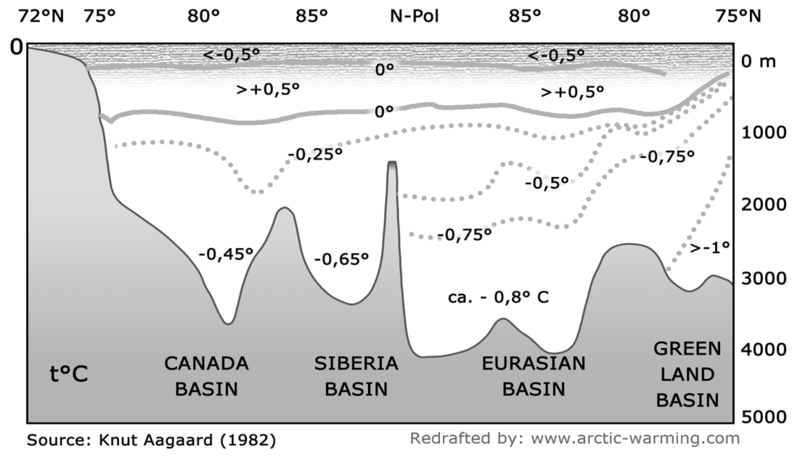 As there is no indication that this warming was generated elsewhere, and subsequently moved to the polar region, it must have been a local source, namely warm high saline Atlantic water carried by the West Spitsbergen Current to the Arctic Ocean , TM14, center row. 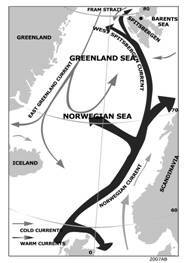 Whether this change was due to an increase of the water masses, or due to a change in the structure of various sea layers over a considerable depth around the gate to the Arctic Ocean, the Fram Strait , is not known. It seems that the latter is the more likely reason. 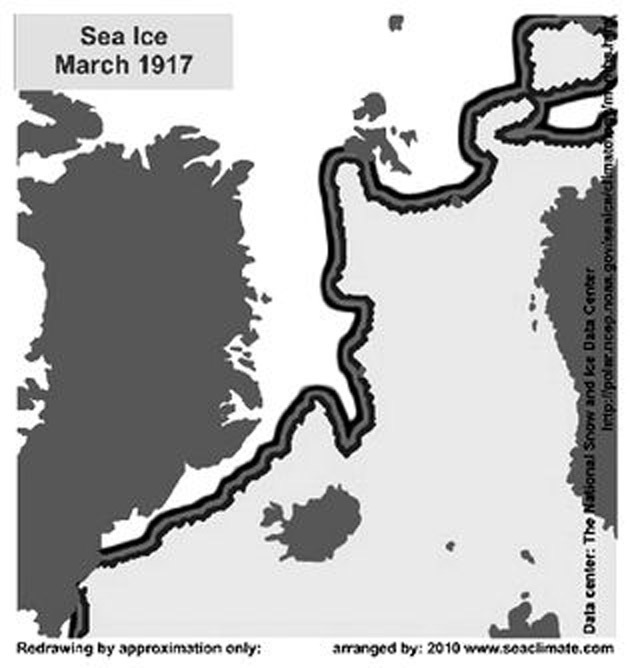 Little is known about an extraordinary North Atlantic sea ice season in 1917. 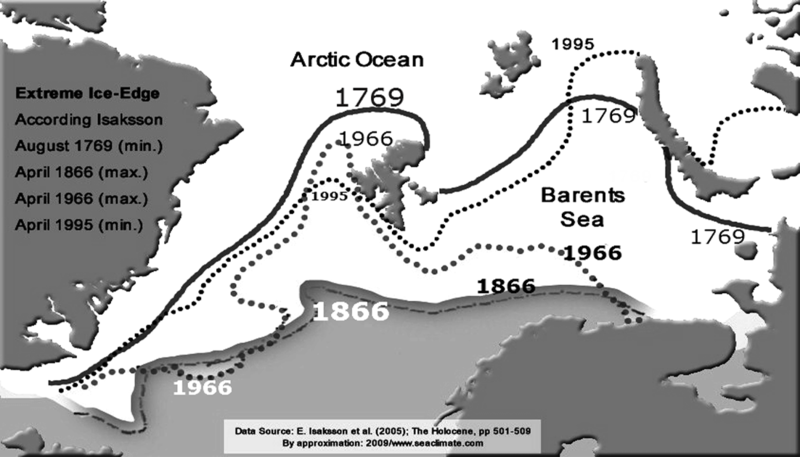 To my knowledge, such a long and extensive sea ice cover occurred only once throughout the 20th Century. Usually there remains a sea ice-free tongue off the shores of Spitsbergen (Fig. I-5). Against all rules, this tongue disappeared in April 1917 (Fig. 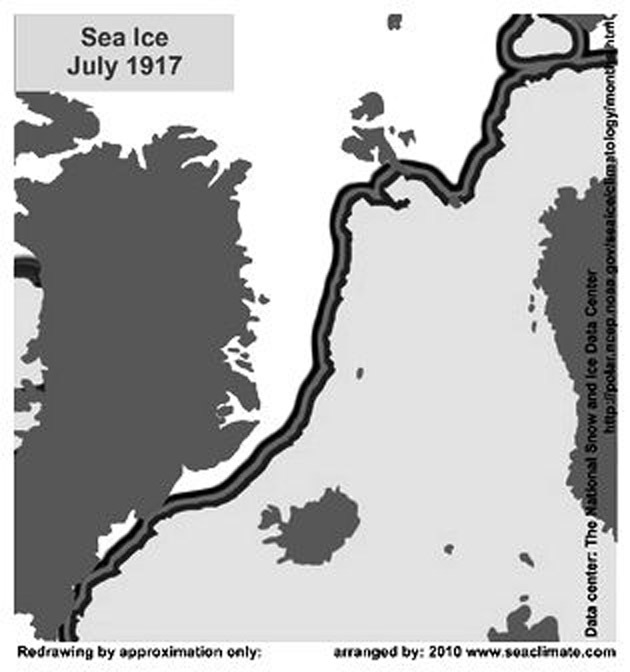 I-6) the sea ice extended far South (Fig. I-7), remained very high throughout June, and only retreated in July 1917 (Fig. I-8). About the consequences one can only speculate, but it was certainly not without any reason. Throughout its long freezing process the ice-covered sea surface layers must release salt, which makes the sea water heavy, and thus increases the vertical water exchange with deeper levels. 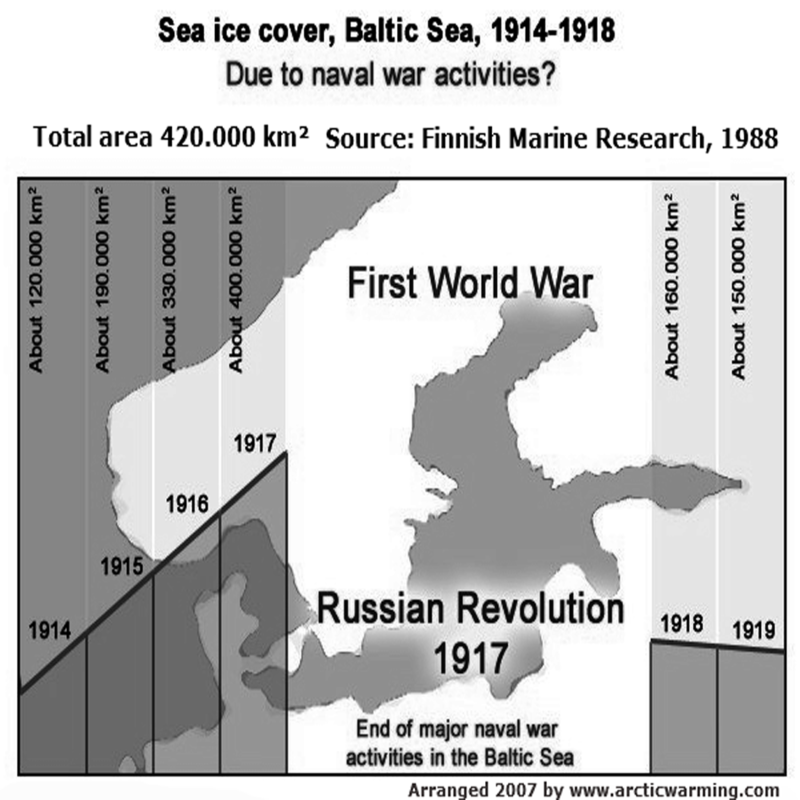 During the subsequent melting process through July 1917 the sea surface would have received a huge amount of fresh water; this stays at the surface level, until salinity and/or water temperatures are back to normal. 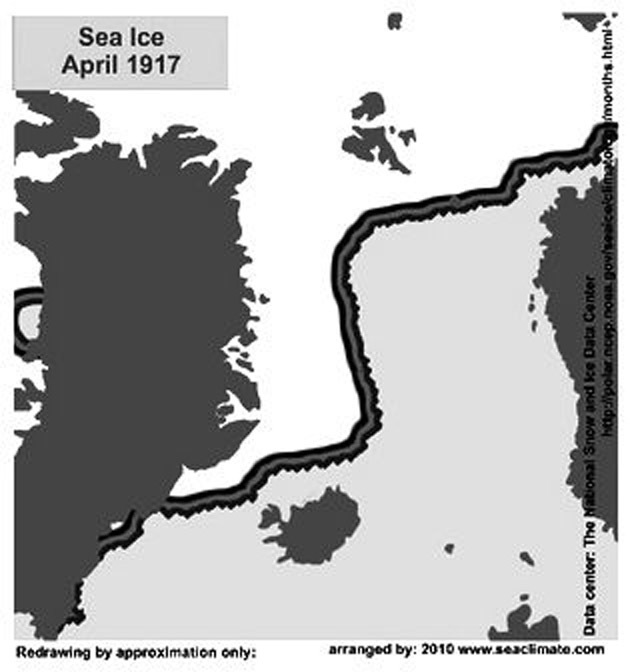 This highly unusual event in the Northern part of the North Atlantic from April to July 1917 could well have contributed to a shift in the ocean structure between Spitsbergen and the Fram Strait, which subsequently caused warming of the Northern Hemisphere from winter 1918/19 to 1940.
heat and salinity over many meters depth. 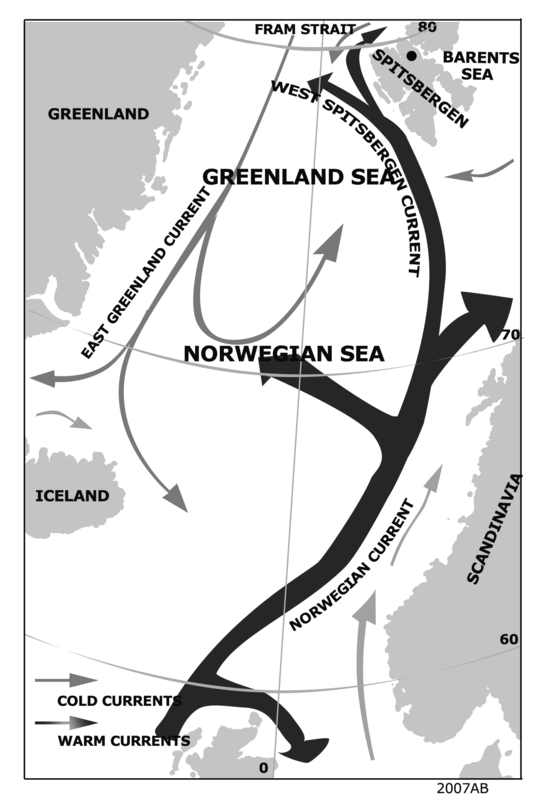 All this water moved north with the Norwegian Current, and the West Spitsbergen Current, to enter the Arctic Ocean after a time period of several weeks or months (Fig. I-16, p. 199). 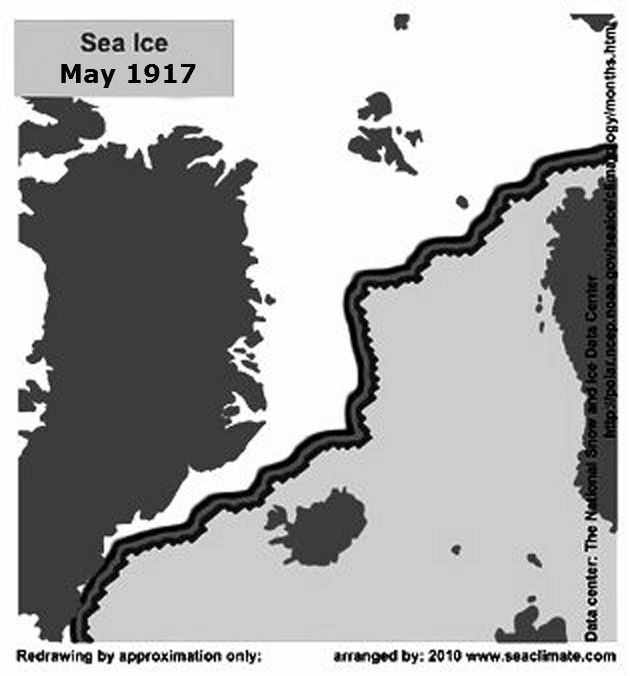 This could have influenced the exceptional sea ice conditions during summer 1917, or even may alone have contributed, via a change in the ocean structure between Spitsbergen and Greenland, to a climatic shift in the high north in winter 1918/19. Analysing the causes and mechanisms for the EAW faces two fundamental problems, of which the interested reader should be aware. On one hand the acknowledgement of the influence of the ocean on all atmospheric processes is still in an infancy stage. How many people and scientists consider weather and climate matters in the relevant dimension between sea water and an air column, which ranges from 3 to 10,000 cubic-meters, this means, that one degree temperature taken from a 3m3 water volume and the atmosphere above, over 10 kilometres, can be warmed by one degree. If the air surface layer over 100 metres has a humidity of 100%, the one degree from the 3m water-column could inject into this layer the amount of 100 degrees. On the other hand for the Arctic in the early 20th Century there are virtually no direct observations available, very few air temperature data series, and not any on ocean temperatures, neither from the sea surface, nor from any lower sea layer. 2. 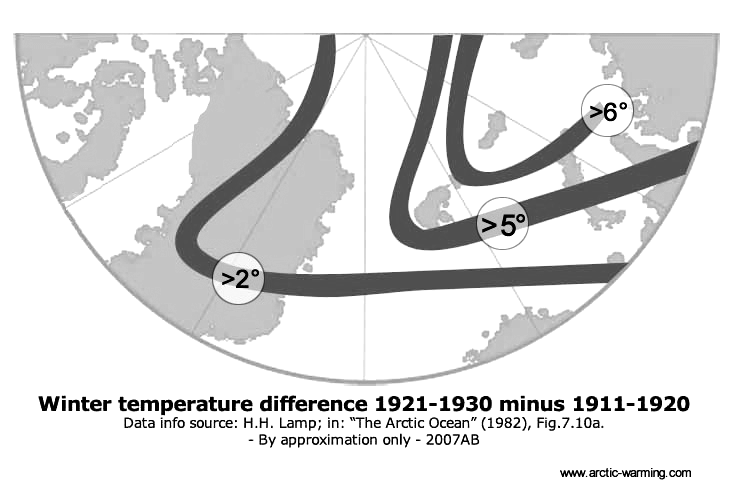 The Arctic temperatures (north of 70°N) between 1915 and 1917/18 were particularly low (Fig. H-2). Western Europe experienced a very cold winter 1916/17, which was the third coldest in Great Britain during the last century. 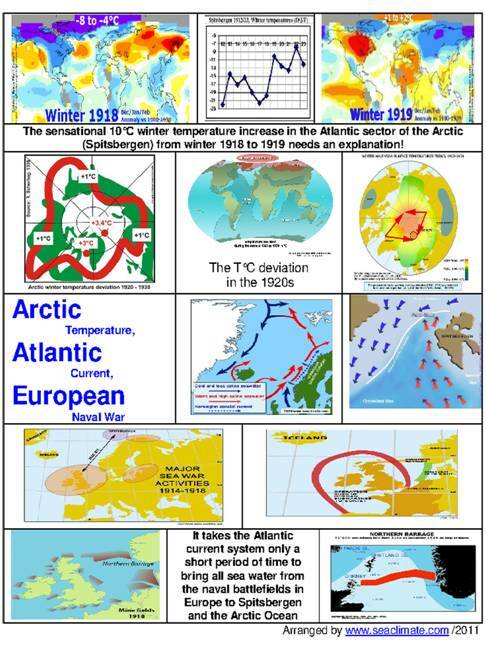 · Long term average weather (climate) is the blue print of the ocean. The influence is a matter of conditions of the water column (e.g. heat and salinity), and a time factor. For a full investigation of the previously mentioned events, one would presumably need many millions of data records along the stretch from the English Channel to the Atlantic section of the Arctic Ocean . There are extreme few sea surface data available, and none from lower sea layers. 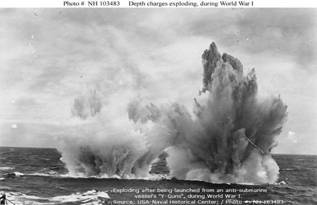 · Until now science has very little knowledge about what kind of human activities at sea (e.g. shipping, fishing, offshore platforms) might have an impact on atmospheric conditions. 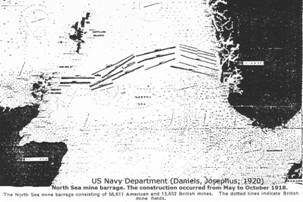 Even naval war activities, which is a very sudden, and forceful penetration into the marine environment, has not reached the attention of science. 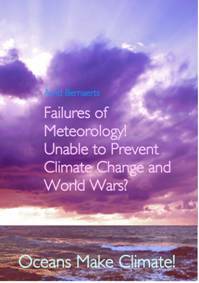 · Neither can any benefit be drawn from the fact that the First World War and the Second World War (WWII) came up with a number of similar weather patterns in Europe , as science has done irresponsibly little research in this respect. That becomes evident if once again the observation by A.J. Drummond at the Kew Observatory (London) published in 1943, is recalled: “Since comparable records began in 1871, the only other three successive winters as snowy as the recent ones (1939/40, 1940/41, and 1941/42) were those during the last war, namely 1915/16, 1916/17 and 1917/18, when snow fell on 23%, 48% and 23%, of the days, respectively” (Drummond , 1943). · August 1914 to autumn of 1916: The first two war years are presumably irrelevant for initiation of an EAW toward the end of the war. The sea areas affected were the Baltic, the route to Murmansk , and all waters around Great Britain (see bottom rows of TM14, p. 191). Which interested meteorologist could have realised that it was not difficult to observe that bigger naval encounters immediately influenced local weather conditions, from good visibility to mist, dust, fog, or rain due to moving from ‘hither and thither’ and shelling. For example it happened off the coast of Scarborough on December 16th 1914 and during the biggest sea battle ever, the Jutland Battle close to the Skagerrak , on May 30 and June 1, 1916 , about which Winston Churchill brilliantly elaborates in his book “The World Crisis 1911-1918” (p. 251-272, and 599-651). · Autumn 1916 to November 1918: The naval war machinery went along in full gear since summer 1916, due to new weaponry and mass production. 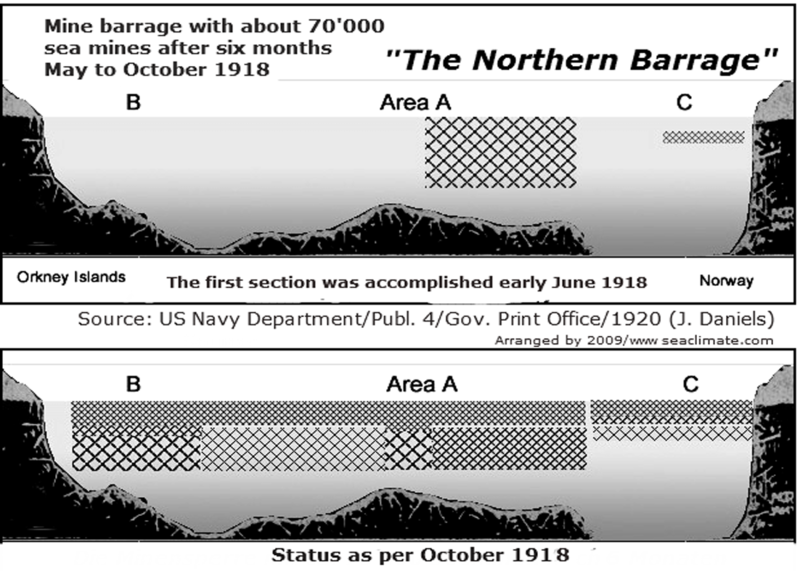 From now on to the end of 1917 the Allies lost, a ship tonnage of about 7,000,000 tons, which means every month between 70 and 350 ships (April 1917) that correlates perfectly with the exceptional summer sea icing in the North Atlantic during the months April to July 1917. · __(A) The Arctic temperature record north of 70°North indicates a period of slightly lower temperatures between 1915 and 1918. (Fig. G3-1). See also: Fig G1-5 (SST, NW of Scotland. · __(B) The famous icy winter battle of Masuria (north-eastern Poland) in February 1915 between the German Army and the Russian Tenth Army, caused the German Field Marshall Hindenburg to question:“ Have earthy beings really done this things or is all but a fable or a phantom”, (citation from: NYT, January 7, 1942). · __(C) The winter 1916/17 was one of the very cold winters in Northern Europe . · __(E) At least one report exists claiming that the sea water at the west coast of Spitsbergen had shown unusually high temperatures in summer 1918. (Weikmann, 1942). · __(F) The Fisheries Research Service/Aberdeen took sea surface temperatures in the Scotland - Faroe Channel that show a dramatic drop from about 1914 to 1920 (Fig. A3-7, G1-6; p. 20 & p.166). · __(G) The Russian scientist Jules Schokalsky informed the Royal Scottish Geographical Society in 1935: “The branch of the North Atlantic Current which enters it by way of the edge of the continental shelf round Spitsbergen has evidently been increasing in volume, and has introduced a body of warm water so great, that the surface layer of cold water which was 200 meters thick in Nansen's time (1895/96), has now been reduced to less than 100 meters in thickness" (Schokalsky, 1936). · The sudden Arctic winter warming 1918/19 (in the Atlantic section), which was presumably the highest temperature rise in the Arctic ever recorded.